Innovate OT-2: OBD-II/CAN WiFi Interface. 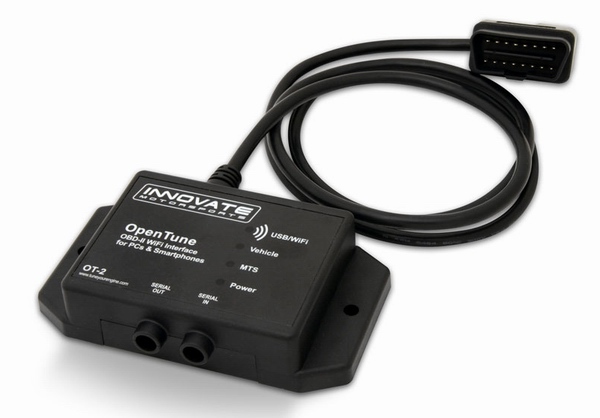 The Innovate Motorsports OT-2 ODB-II WiFi Interface provides a link between any late-model cars or trucks and an Apple TM iPhone TM or iPod Touch TM. The OpenTune interface allows high-quality data display, logging, and analysis from any vehicle made since 1996, and integrates with Innovate air/fuel meters and other modular tuning components. The LogWorks Mobile TM software, available from the Apple TM online app store, is a full-function performance meter, even without the option OT-2 OBD-II interface. Car computers these days are connected to hundreds of sophisticated sensors. The OT-2 allows you to 'open' any car’s computer, and directly see what these sensors are measuring. Users can select multiple channels from hundreds of available parameters, and log the data up to 12 times per second. Users can also record many conditions, states, and codes as 'status' channels, and reset check engine lights and other trouble codes. - Compatible with all Innovate MTS (Modular Tuning System) devices, including LC-1 'Lambda Cable' Air/Fuel Ratio sensor controller, LM-2 Air/Fuel Ratio meter with analog inputs, TC-4 4-channel thermocouple interface, and more. - Efficiency Meter - Interactive efficiency calculator (MPG, GPM, and AES) Advanced Diagnostics – Record and analyze critical vehicle parameters. Read and clear DTCs (Diagnostic Trouble Codes). OT-2 required. Performance and Efficiency functions work without OT-2, however data quality and accuracy is dramatically better when utilizing the OT-2.